Summer’s coming to an end (say whaaaaat?!?!) 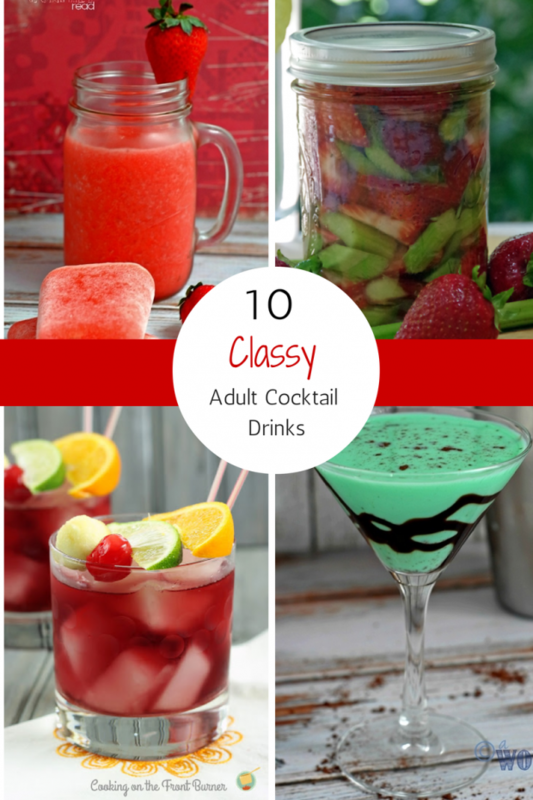 and I have a fun roundup for you of 10 Classy Adult Cocktails you can make. Might as well leave summer with a bang, right? Which one is your favorite on this list? I love them all but may be saving the Red Apple Sangria especially for a fun fall drink. If you’re trying to please a crowd, then this is the spiked bunch to make for your bunch! On a budget? You might want to give this Poor Man’s Sangria a try! This is one adult drink that everyone needs to try at some point in their lifetime. Can you say YUM to Pina Colada? Looking for something sweet and yummy to try? Anything that has to do with Baileys is a must try! This is an interesting twist on an adult drink and one that you may want to recreate every month. Strawberry Shortcake in the form of an adult drink is like a match made in heaven. Well, isn’t this an interesting twist on a drink? It’s just as delicious as it sounds. Want to feel like a kid again? Make these popcycle to feel like an adult with no responsibilities, just for a moment. Take the Rhubarb from the garden and turn it into a drink you won’t easily forget! Now this sounds like a drink worth trying. The taste of red apple in the form of an adult drink? Yes, please!